Haematology is the branch of medicine that deals with diseases of the blood and blood-forming organs. Haemophilia is one of the most important diseases of haematology research. Medically, the classical treatment of haemophilia is transfusion therapy, which has been widely used for years. However, the transfusion can bring several complications for haemophilic patients, such as the onset of blood borne infectious diseases. This book discusses such diseases, as well as the new trend in blood product safety management. Until present, the new modality of gene therapy is the hope for successfully treating haemophilia. 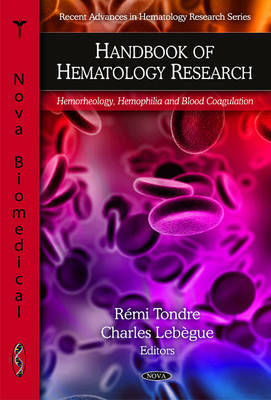 The authors of this book briefly review and discuss this new haemophilia treatment. In addition to examining the aetiology, pathogenesis and treatment of haemophilia, the factors involved in the activation of blood coagulation are examined as well. Other chapters in this book explore the immune responses and induction of immune tolerance to FVIII/FIX in haemophilia gene transfer, the haemostatic changes in complicated pregnancy states like preeclampsia and pregnancy-induced hypertension, a review of the new routine parameters for diagnosis of the early phases of pathologic disseminated intravascular coagulation (PDIC), and the quantitative and qualitative congenital plasminogen defects of the fibrinolytic system.